Whether you’re an experienced angler or salmon fishing for the first time, Oregon offers lengthy salmon seasons and plentiful runs. So where do you find the best Oregon salmon fishing and experienced salmon fishing guides to make your trip a success? Ask the locals of course. Tracking the tides, analyzing currents and fish runs, and putting experience to use over a decades spanning fishing career has made Jason a successful salmon fishing guide. 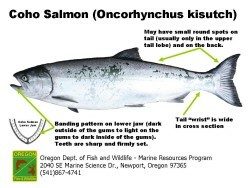 There are five species of salmon found in the Pacific Northwest the two main species we are known for in Oregon are the Chinook Salmon or “King” run and the Coho Salmon or “Silver” run. 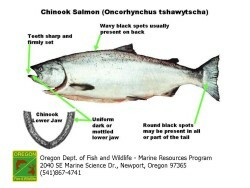 Chinook Fishing is great from March until late into Fall here in Oregon. The Spring Chinook are the first to start their return, some of these Springers start their return as early as February, the main bulk of this run is between March and June. These Springers are some of the most sought after seafood around, the oil content these fish contain to help them make it through the long spawning run makes their flavor unbelievable. Next Up is the Beginning of the Fall Chinook at “Buoy 10” in Astoria Oregon from August into September. The Fall Chinook Run continues in Tillamook and will keep us busy through Fall. With half day and full day salmon fishing trips available, you get salmon fishing that suits you. We provide all necessary equipment. With reels, rods, and tackle from Shimano, G. Loomis, and Shortbus Flashers you’ll be prepared to catch the biggest salmon in the Columbia. You just need to gather a few important items, before you arrive.